Enhanced Performance. Adding an amplifier to an antenna increases available signal strength. The extra JUICE™ will help overcome challenges including coaxial cables over 100 ft., splitters, or weak signals in the area. 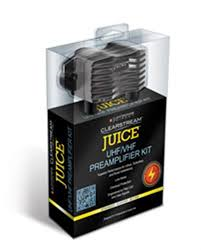 Whether you live in an urban, suburban, or rural area, JUICE™ offers ample gain and best-in-class overload protection for dependable reception. Comes with 2 short RG6 cable runs included in package to install mast mounted Preamp and power supply to TV or splitter.